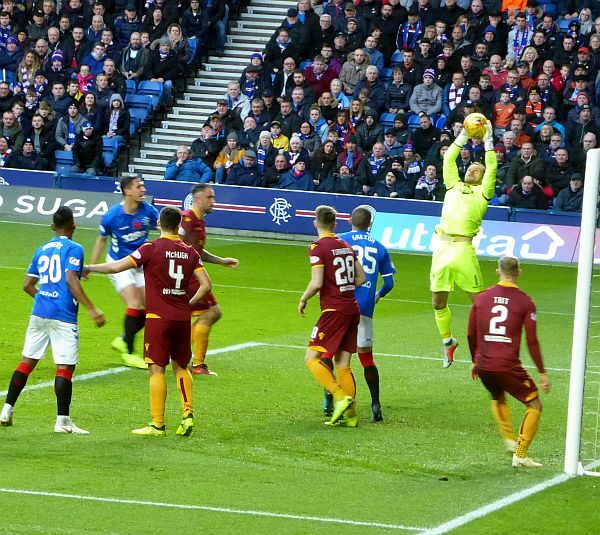 Motherwell suffered a humiliating 7-1 defeat at Ibrox. We had to play for 55 minutes with ten men but that hardly excuses the collapse that followed. Some deep reflection is needed before we take to the field again. The collapse followed the 35th minute turning point. The game was level but we suffered a triple whammy when a McHugh handball gave Rangers a penalty. McHugh was awarded a second yellow and left the field, Robinson lost the plot and joined him in the stand then Tavernier scored from the spot. The frustrating aspect was that we had recovered from the loss of an early Arfield goal when fine work by Bowman in the opposition box allowed hime to deliver a perfect square ball to allow Main to finish from close range. We were very much part of the contest and the wind had been taken from the home team’s sails. But we collapsed and conceded a third three minutes after the penalty The team talk at the break had to cope with a 3-1 scoreline and an adjustment to cope with the loss of McHugh. The obvious change followed with Rose replacing Bowman but any hope of a stout defensive performance in the second period disappeared as goals flooded in. We conceded with the clock showing 59, 61, 68 and 75 minutes and were grateful when the whistle arrived promptly as the clock clicked to 90. It was a terrible performance that undid the good work of the previous week. The team that had gained some confidence with wins against St Mirren and Dundee was dismantled. Maybe it is a good thing that we have an international break to let the wounds heal.